One of the best things about staying at the farm was their giant compost pile! Whenever I have access to a compost pile, I am absolutely giddy. You can imagine how many scraps and peels we produce while eating raw…it’s amazing. I try to keep it, so we can dump it strategically, but not everywhere we are staying has a compost pile. We’ve been very blessed that FOUR families have had compost piles this month…it’s been great being able to dump it. However, this isn’t always the case. We are currently searching for a composting solution that is RV friendly! We found the NatureMill…and that is my DREAM composter! I saw one in person at Dwell Smart in Charleston, and oooooh how I loved it! I want one desperately…but alas, they are a little too spendy for our little budget. If you are looking for a composting solution for a small space, do check it out! I have also looked into vermicomposting, but found that the temps need to stay in a range that probably isn’t do-able in the heat of the summer. I have even tried collecting it in bags and bringing it to coops, etc. 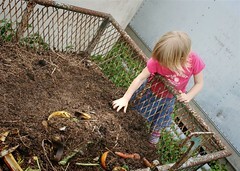 who compost, but most will not take it unless it’s their own scraps. We need your help! If you have solutions for us, we’d love to hear them. We need a way to store the scraps until we find a compost pile…or, preferably a way to compost it ourselves. C’mon all you green thinkin’ people…I know you have ideas!